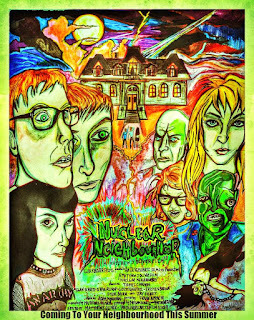 “Nuclear Neighborhood” is a film that looks & feels like it came from graduates of Troma University; a sci-fi/horror film made with little budget but plenty of fun and creativity. Within no time, Matthew J Oliver’s film jumps right into the meat & bones of the story. Dan’s girlfriend is kidnapped by a strange man in a creeper van, and Dan’s friends conclude that she’s being kept in the weird apartment building up the road. Weird because all kinds of unexplained activity and an assortment of trippy, deformed people that seem to inhabit the building. As it turns out, radioactivity is the root cause of the eerie phenomenon, but this info isn’t enough to keep Dan and crew from breaking in to save his girl. As the team splits up, they encounter monsters, booby traps, and misunderstood freaks of nature as they get deeper into the madness and closer to the villain who took Dan’s woman. “Nuclear Neighbordhood” will be screening at the Art Theatre of Long Beach on Thursday August 6th @ 9pm, The Dark Room Theatre in San Francisco on Sunday Aug 9th @ 7pm, and Movie at LoBot Gallery in Oakland, Ca on Sat August 8th @ 9pm. With light-hearted fun, director Mikel J. Wisler brings the audience into a campy spy thriller, and just when you think you think you’ve figured out each of the possible ways the story can go, he pulls the rug out from you in the most unexpected way, bringing some very authentic laughter and finishing the short movie in a most relatable way.